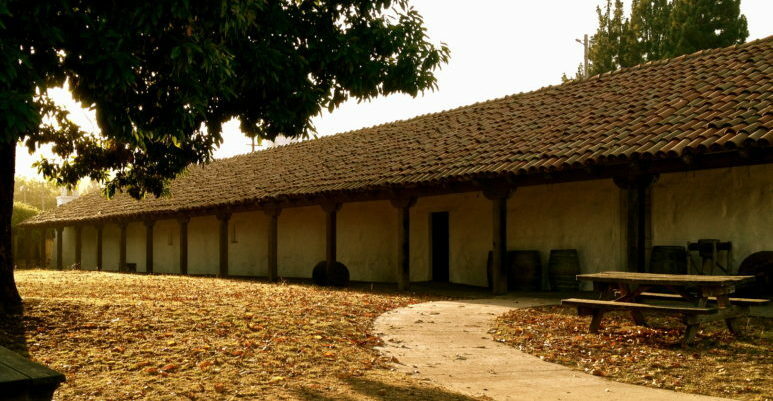 Santa Cruz Mission State Historic Park is home to the oldest building in Santa Cruz County. Built between 1822 and 1824 by local Ohlonean and Yokuts Indians, the park’s signature adobe is the only remaining structure from Mission Santa Cruz, founded in 1791. One of just four adobe buildings left in Santa Cruz County — and sometimes confused with the nearby replica mission chapel — it is the only building of its kind preserved as a museum in the State of California. The adobe served as housing for Neophyte families who lived and worked at the Mission, which operated until 1834 when it was secularized. After decades of private ownership, the adobe was sold to the State of California, extensively restored and finally opened in 1991 to the public as the Santa Cruz Mission SHP. The park celebrated its 25th year in 2016. Learn more in the Santa Cruz Mission Adobe fact sheet. Friends of Santa Cruz State Parks rallied the community to save Santa Cruz Mission SHP from closure in 2012. Friends funds interpretation services and a portion of park operations, and also runs the Mission ParkStore. In addition, Friends has implemented key improvements at the park, including a remodel of the patio, the opening of new interpretive exhibits, renovated outdoor cooking facilities and new hours of operation to serve local school children (approximately 2,500 third and fourth graders visit the park annually). Friends also established the Mole & Mariachi Festival, a bicultural celebration each September. The park is supported by the Mission Committee, members of which include representatives of Friends, State Parks and dedicated community volunteers. The Mole & Mariachi Festival is a benefit for nonprofit Friends of Santa Cruz State Parks in support of Santa Cruz Mission State Historic Park. Learn more. Mural designs by Mission Hill Middle School students Katherine Tkoch, 12, and Flora Chatwin, 13, were chosen for the new Santa Cruz Mission State Historic Park mural in celebration of the 25th Anniversary of the opening of the park. Their combined design was recreated in tesserae, a colorful tile that will be formed in the shape of the artist’s design to create the mosaic mural. Community volunteers, Mission Hill Middle School students, in cooperation with Friends and California State Parks installed the public art in May 2016 under the direction of noted local artist Kathleen Crocetti who has created murals on Water Street, Soquel Avenue and Laurel Street bridges. As a guidepost to draw visitors to the park, the mural is on a series of retaining walls along the park’s Mission Street boundary, facing downtown. The mural site is at the stairway entrance to the park on Mission Street, up the hill from the Town Clock.